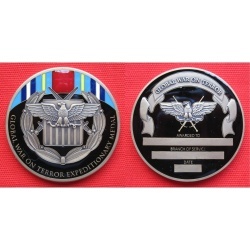 The Global War on Terrorism Expeditionary Medal is awarded to members of the US Armed Forces who have been operationally deployed abroad to combat terrorism after September 11, 2001. America's Armed Forces have struck fiercely and ferociously at the enemies of freedom in response to the attacks of September 11, 2001. Established be Executive Order or President George W. Bush in 2003, this medal rewards those who have left their homes - sometimes never to return - to serve at the forefront of a new kind of war. This coin commemorates the heroic resolve of America's sentinels of liberty to protect the United States - at any price and on any shore.